At present the Mukkuruni Vinayaka shrine is a modern building constructed of polished granite. It can be dated with all probability to the late 19th century. This Vinayaka represents the Trimurti. Therefore this shrine has three stupi on the top of the shikharam or cupola. Mukkuruni means three (munru) times four measures (kuruni). On special occasions an offer consisting of three modaka made of four measures (kuruni) of rice are given as nivedya or food offer. The Early Chola Mukkuruni Vinayaka temple consists of the shrine’s garbhagriha and ardhamandapam with three pavilions or shrines added at a later date. (1) The ground-plan and lay-out. (2) The profile of the kapota. (3) The shape and decoration of the kudus. (4) The shape of the podigai or corbel. (5) The shape and decoration of the shikhara. But it also confronts us with several unique features. (1) A rectangular garbhagriha and shikhara rounded off at the corners and topped by three stupi. (2) An ekatala building with several characteristics of a dvitala: a hara with shala and karnakutis. (3) The ekatala and dvitala characteristics synthesized by integrating the griva niche into the hara. – I indicates an ekatala or one storey building. – 2 indicates a protruding section in the centre of each vimana wall. – b means the vimana has six pilasters in each wall. The protruding section in the wall of the sanctum is clearly visible. The kudus that decorate the kapota indicate the presence of pilasters in the structure of the wall. Based on our observations we can draw the ground plan as in this picture. The pairs of pilasters that flank the central vimana niche on both sides are so close together there was probably no space for additional niches besides the main central niche. The space between these would most likely have been a ‘blind niche’, a niche without sculpture. The general pattern is that a shrine with six pilasters has two levels or storeys, and would therefore be a dvitala. Here we have a ground plan with six pilasters, but no second tala. From the kudus on the kapota of the roof of the ardhamandapa it can be concluded the ardhamandapa walls had two pilasters each. The presence of the shrine in front of the niche indicates there was a devakoshta or niche with a murti or deity placed in it. From the spacing of the pilasters, and the projection of the vimana wall, it can be inferred this shrine would have had one niche in each wall of the garbhagriha and one niche in each of the ardhamandapa walls, with a total of five niches. It is not possible to know which deities would have found a place in the niches of this shrine. – A indicates a garbhagriha directly connected to the sanctum and slightly narrower. with simhamukhas, also a feature of Early Chola temple architecture. and experiment, according to Dr.Hoekveld . Other temples build in the same period, that is before 910 CE, have smooth shikharas. Also throughout the 10th and 11th century most shikharas were smooth. at the same time as the griva niche. The deity in this niche is Dakshinamurti, Shiva as a teacher, who is usually placed facing south. He is flanked by rishis on both sides of the niche. This combination of ekatala and dvitala, with 6 pilasters, a hara, and a griva niche synthesized with the shala in this way, is unique. was much less common in later temples. All these points together make it entirely probable to argue for a date of construction during the earliest phase of Chola architectural development. This is another reason to argue for an early date for the Mukkuruni Vinayaka temple depicted in the photo. Alas in the photo not enough is visible of the base to be useful for analysis. In the photo we can see three secondary buildings that must have been added to the original shrine some time after its original construction. In front of the ardhamandapam is a mukhamandapam. Its base, pillars, roof and general lay-out show it to be of a much later date, very possibly Later Chola. The base is decorated with a lotus moulding and with sculpted panels of which we cannot see the details. The pattika is shaped like a kapota with kudus. Above the pattika is another layer of sculpture the details of which cannot be made out. The steps leading into the mandapam and the shrine are positioned on the south side of the platform in such a way devotees would enter from the side and would not directly approach the deity in a straight line. They are decorated with a curved railing in the form of the tongue of a makara sculpted at the top of the railing. The structure is reminiscent of a ratha mandapam, a hall in the form of a chariot, although there is no evidence of wheels or horses. The pillars are polygonal, and divided in three equal sections from above the low base. The kapota has a strong curve. We would expect the space under the mandapam to be dark, but it is possible to make out details of the dvarapala niches. It may be that there was no roof cover at the time of this photo. niche was under worship and the devotees had felt the need to convert the niche into a shrine. The jagati of the base base has a pronounced lotus moulding, a round kumuda, and a kapota in the place of the pattika. The kapota of the roof shows a reasonable pronounced bell-shape. The base could be dated to the later Chola period (compare for instance the base of the Airavatesvara temple in Darasuram). there seem to have been sculpted panels. The kapota of the roof shows a strong wave-form pointing to a relatively late date. considerable time elapsed between the original construction and the building of the secondary shrines. Land of the Cholas consists of the Caveri Delta. It was where the Chola dynasty had its power base. Nadu Nadu means literally Central Land. It consisted of the areas around modern Cuddalore and Pondicherry and is now generally known as South Arcot. But although Chidambaram could be considered to belong to South Arcot geographically, historically it has always had strong connections with the Chola dynasty. The presiding deity, Shri Shiva Nataraja was the Kula Devata or family deity of the Cholas. Scenes of Rajaraja Chola worshipping Shri Nataraja in Chidambaram are depicted in the Rajarajesvara temple in Tanjore, build around the year 1000 CE. Generally the deity of Chidambaram was held in high respect by all the kings and dynasties of South India. This is witnessed by the compositions of the Tevaram, by inscriptions, and by legends and oral traditions. conventions popular in the late 11th and 12th century. the gopurams. The discovery of the photo of this Early Chola shrine calls for a reconsideration of the accepted history of the Nataraja temple in Chidambaram. (3) This discovery supports the findings of Dr.Sharada Srinivasan. Her metallurgical analysis of Ananda Tandava Murtis suggests some may have been crafted as early as the 9th century under patronage of the Pallava dynasty. 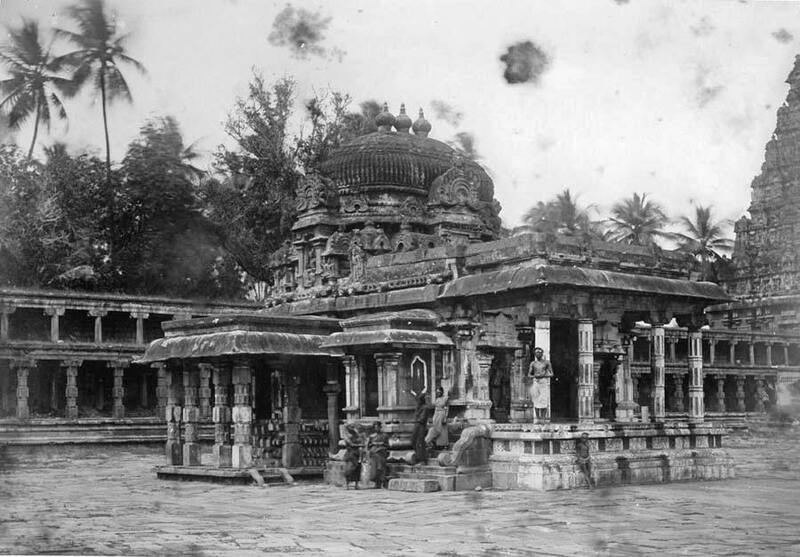 Connections between the Pallava dynasty and the Chidambaram temple are also evidenced by the literary tradition. of Early Cola Temples. An art-historical study on geographical principles. PhD Thesis of the Vrije Universiteit te Amsterdam, 1981.
of the Shri Shiva Nataraja temple in Chidambaram. All other photos by the authors.